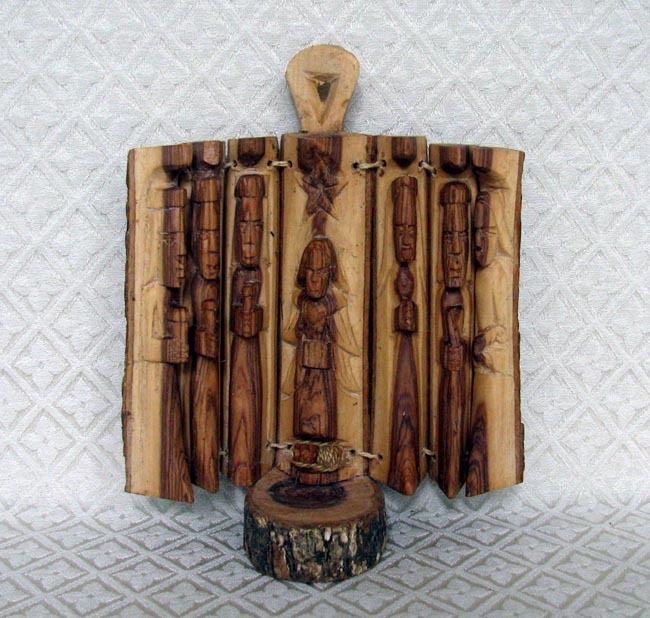 This hand-carved Nativity comes from a single piece of wood. Kamba carvers in Kenya cut a length of wild olivewood branch along its length into seven sections that are later bound together with sisal twine hinges. The interior figures are hand-carved into each section of the log. From the right side of the photo, the figures are: a shepherd holding a lamb, Joseph with a staff, Mary with folded hands, an angel with wings in the center section hovering above baby Jesus (with a sisal twine blanket wrapped around him), and finally three wise men with gifts on the left. The scene folds together into its log shape for storage. The scene measures 7 inches tall. This Nativity was made by a man named Mugwana in an artisan workshop run by Steven Kyalo in a slum called Gikomba, near the city center of Nairobi, Kenya. Steven also runs an orphanage and school to help 89 orphans in Nairobi. He works very hard to help others. To learn more about Steven’s wonderful service, view the Helping in Kenya photo album on our Facebook page. $35. Please click here for purchasing instructions.